Of all furniture, chairs are perhaps the most varied, personal and taken for granted items. They have crept into our lives, our language and culture in a way that perhaps no other single item of furniture has. We all use a range of them on a daily basis, every home has several, from palatial thrones to the humble stool, from the Windsor to Chippendale and Hepplewhite, they have a deep cultural significance, as well as fulfilling the basic function of providing something to sit on. We have the ‘Chairman’ of a board, people ‘chair’ meetings, Kings and Queens have ‘thrones’ - the highest form of ‘chair’. Chairs have a deep ceremonial, as well as functional significance. So when Chloe Darling brought together 170 chair makers and designers to Westonbirt Arboretum over the May Bank Holiday weekend for Chairs 2004, it was to celebrate and share the cultural and physical diversity of chairs and seating. The Cotswold Antique Dealers Association put on a display of historic chairs. 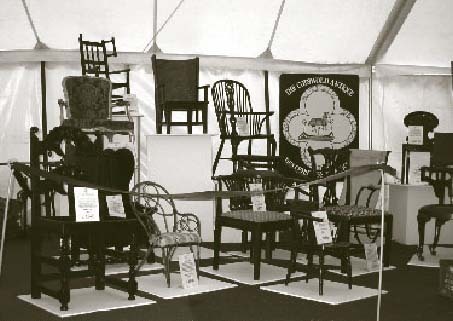 The event was attended by makers from 11 different countries, as well as the length and breadth of the British Isles and with so many diverse backgrounds and interests, the exhibition of chairs was perhaps unique. 120 chairs were displayed simply in the order that that their makers had booked in. No attempt was made to classify, or group them, resulting in a true display of the sheer diversity of the approach to seating. As makers and designers we have interpreted the need to sit down in hundreds of forms, from the simple to the outrageously ornate, from the hand crafted to the mass produced. There were a series of lectures from a prestigious line up of speakers covering three subject areas, Provenance, Design and Inspirations. Dr Bill Cotton, author of ‘The English Regional Chair’, gave the opening lecture on Provenance of Country chairs, a field, which until 30 or so years was largely overlooked and little studied. Yet in many ways the lives and stories of those who made this simple furniture for ordinary people are every bit as fascinating as the well-recorded history of the classical schools of furniture design. Bill Cotton has studied this field in great detail. He has a fantastic ability to give us an insight into the lives and daily goings on of the mostly rural men and women who made the vast range of regional chairs with which we are all familiar. ‘The English Regional Chair’ is perhaps the most in depth work on the subject. Philip Koomen, designer of the much publicised pond life benches, delivered a rather different interpretation of the subject by suggesting that the provenance of the present and future should be of an environmental and social nature. Philip felt that we should judge a piece of furniture by the impact it is making and use it has on the environment. We should also strive, as makers, to use local timber from sustainably managed forests (echoing the Woodland Heritage ethos); use eco friendly and low energy methods and that these facts should be the story, or provenance of a piece. Scott Swank, Director of the Shaker community of New Hampshire gave a fascinating talk on the Shaker design, its simplicity and enduring appeal, and how his studies have identified unique and subtle differences, which were the signatures of the different Shaker communities in 17th century America. A combination of a strict religious doctrine and a sense of minimalism along with that of functionality gave birth to what has become an iconic design. Shaker ‘style’ furniture is still immensely popular today and sells across the world. Anthony Buxton (historian and lecturer) provided an insight into chair design from William Morris and the Arts and Crafts movement up to the present day. Particularly looking at how fashion and world events drove the design process through a series of reactionary and influential periods. Whilst we makers were sat intently listening to the speakers and discussing the matters at hand, the public poured in to look at the exhibition of chairs large and small, modern and traditional, from the high conventional to the weird and wacky. When it came to the subject of inspiration the speakers were again highly varied in their work and outlook on life. Mike Dunbar from Hampton, New Hampshire, author and maker of ‘American Windsor Chairs’, now runs the Windsor Institute, a school of Windsor chair making which has several hundred students going through its classes every year. Mike spoke on the subject of success and told his own story of how he fell in love with an old Windsor chair he bought in a yard sale in 1971 and how this inspired him to go onto make professionally for 10 years before giving up to write and teach others. His message was full of American self-belief and being driven by a desire to succeed. Woodland Heritage member, Gudrun Leitz who now lives in Herefordshire, teaches green wood and makes very organic pieces of furniture inspired by nature and the wood which she owns and from which she harvests most of her timber. For Gudrun, inspiration is about that link to the natural world, about making pieces that reflect the beauty and diversity of trees and the woodland environment. Antique chairs were well represented by a fine display from The Cotswold Art & Antique Dealers Association with a collection of chairs through the ages and it was interesting to see the way that these traditional designs had influenced some of the makers. Whilst many of us were drawing from the past and time-tested and much-loved styles, others broke with convention to explore modernism in design. There were some lovely examples of traditional designs based on antique originals, proving the enduring appeal of many traditional designs. American Windsor maker Dave Sawyer came over for the event and exhibited one of his fine American Windsors, proving the interesting divergence in style that developed in the US Windsor, as opposed to its traditional English cousin. On the afternoon of the Bank Holiday Monday, 43 of the exhibition chairs, including all those by the overseas makers, were auctioned off with prices ranging from a few hundred to a few thousand pounds, proving that not only do styles and tastes vary, but so do prices. When it comes to chairs there really is something for all tastes, price ranges and practical uses. Whilst this was a one-off event it seemed so be highly successful and greatly enjoyed by those that attended. If it is possible, it may be repeated at some point in the future to celebrate all things - chairs, timber and woodworking.